Enterprise storage company Tintri debuted its ‘VM-aware’ (virtual machines) storage appliance less than a year and a half ago, and already it has raised over $60 million in financing from New Enterprise Associates (NEA) and Lightspeed Venture Partners. That includes a Series D round that it is announcing today. Tintri has secured a further $25 million in a round that was led by new investor Menlo Ventures, with prior backers participating. The company’s VMstore product is a purpose-built storage appliance for virtual machines, basically providing business with smart and simple storage for a variety of virtual environments. Tintri says its solution was built from the ground up for flash and virtualization and comes at ‘disk prices’. Since its March 2011 launch, Tintri says it has signed up over 100 enterprise customers worldwide, and that it has expanded its team with key senior hires from companies like Google, Citrix, Netapp, VMware and more. 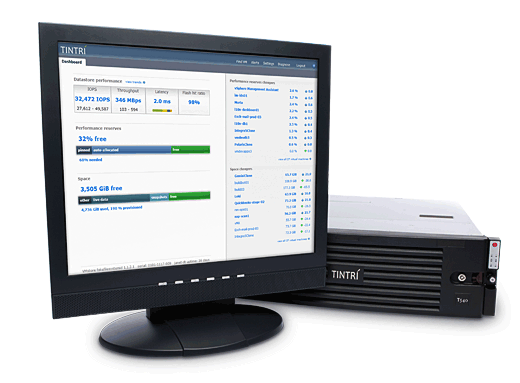 Tintri is privately-held and based in Mountain View, California. The company was co-founded by Dr. Kieran Harty, who was formerly the EVP of Engineering at VMware, and Mark Gritter, previously a Staff Engineer at Sun Microsystems.